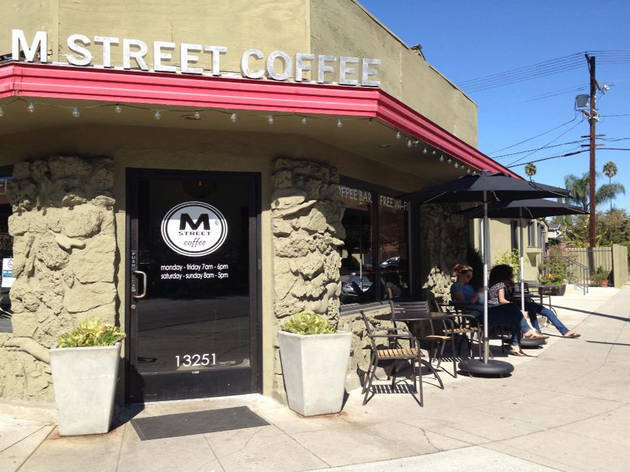 Part art gallery, but mostly coffee shop, M Street Coffee serves as the neighborhood meeting spot for Sherman Oaks' denizens and Valley creatives. A standard coffee and tea menu is offered (their Caramel Royale is the way to go when looking for a little indulgence), but the range of milk options is as varied as the dairy section at Whole Foods: soy, rice, almond and more. Gluten-free snacks are on hand as well, and a great selection of pastries (we recommend the banana bread—toasted!—with a thin slathering of butter). Settle into the couch or find an open table, where you'll likely be surrounded by regulars: a cartoonist who might draw a sketch of you if you ask, a screenwriter working on her next feature, a woman who makes her own flower crowns and hats. 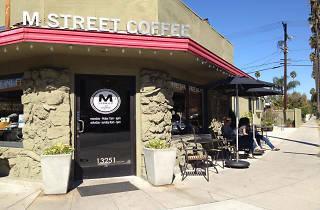 Oh, and the cutest kids in the neighborhood, who are fawned over by the staff and who will likely have their first cup of coffee at M Street. Lovely neighborhood coffee shop. I went here several times when I lived in the valley - everyone working was usually pleasant and helpful. I also never really had any problems with the coffee or drinks I ordered. It isn't a place that will blow you away, but it is definitely a quiet and welcoming spot in the area. They have a few tables available and it seems to be a popular place to work as there are usually a decent amount of people there with their laptops. The people at M Street are so nice and sweet. Live the atmosphere and of course they make an awesome cup of Joe. Great coffee and great people! A very well run coffee shop. This shop is the bomb dot com! Great coffee and great atmosphere!!! This is my go-to coffee shop. Start coming here as a regular and you'll immediately find friends here - artists, writers, creative people who are always making something exciting. The coffee is great (this is definitely the kind of place where they'll memorize your order after a few visits), and they have a superb selection of baked goods, including vegan and gluten-free ones. Shout out to Kate, who is always smiling behind the counter and makes the best chai lattes anywhere.